According to the United States Census Bureau, the city has a total area of 4.9 square miles (12.7 km²), of which, 4.9 square miles (12.6 km²) of it is land and 0.04 square miles (0.1 km²) of it (0.41%) is water. 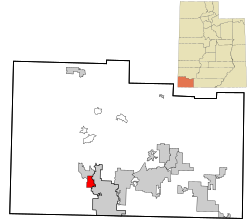 In 1854, Jacob Hamblin was called by Brigham Young to serve a mission to the southern Paiute and settled at Santa Clara in the vicinity of the modern city of St. George, Utah. The town is among the oldest in the area. The first settlers built Fort Clara or Fort Santa Clara, in the winter of 1855-1856. In the fall of 1861, Swiss Mormon colonists arrived at the new settlement, but shortly afterward were victims of the large flood in the Clara River that wiped out the fort and most other buildings, its irrigation dams and ditches, in early in 1862. This flood was part of the Great Flood of 1862. Hamblin's first home there was included in the destruction of this flood. His second wife Rachael saved one of their young children from drowning, but the child soon after died from exposure. Rachael never fully recovered from the exposure she got from the flood. Swearing to avoid the risk of flood, Hamblin built a new home on a hill in Santa Clara. Owned today by the Church of Jesus Christ of Latter Day Saints, it is operated as a house museum, where Mormon missionaries give daily tours. 19th-century Santa Clara was largely inhabited by Mormon immigrants from Switzerland. Among these was Daniel Bonelli, who after the destruction of the flood went on to be a pioneer colonist of St. Thomas, Nevada in the Moapa Valley, a farmer, later a salt miner and the owner of Bonelli's Ferry, at Rioville, Nevada on the road between southwestern Utah and Arizona on the Colorado River at its confluence with the Virgin River. As of the census of 2000, there were 4,630 people, 1,225 households, and 1,134 families residing in the city. The population density was 948.1 people per square mile (366.3/km²). There were 1,294 housing units at an average density of 265.0 per square mile (102.4/km²). The racial makeup of the city was 97.32% White, 0.15% African American, 0.30% Native American, 0.28% Asian, 0.32% Pacific Islander, 0.48% from other races, and 1.14% from two or more races. Hispanic or Latino of any race were 2.03% of the population. There were 1,225 households out of which 57.3% had children under the age of 18 living with them, 86.0% were married couples living together, 4.8% had a female householder with no husband present, and 7.4% were non-families. 6.4% of all households were made up of individuals and 3.6% had someone living alone who was 65 years of age or older. The average household size was 3.78 and the average family size was 3.96. In the city, the population was spread out with 40.2% under the age of 18, 9.3% from 18 to 24, 23.7% from 25 to 44, 17.3% from 45 to 64, and 9.5% who were 65 years of age or older. The median age was 26 years. For every 100 females, there were 105.0 males. For every 100 females age 18 and over, there were 101.8 males. The median income for a household in the city was $52,770, and the median income for a family was $55,000. Males had a median income of $41,350 versus $21,495 for females. The per capita income for the city was $15,957. About 2.7% of families and 3.5% of the population were below the poverty line, including 4.1% of those under age 18 and 2.8% of those age 65 or over. Santa Clara is home to several sites of importance to The Church of Jesus Christ of Latter-day Saints (LDS Church), including the Jacob Hamblin Home and the old Relief Society house, built in 1907. It has a historical cemetery. Washington County School District operates public schools. 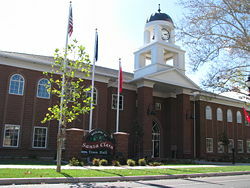 Wikimedia Commons has media related to Santa Clara, Utah.